Recently, Austria became the only country in western Europe with a far-right partner in government, as a party founded by former Nazis after the Second World War took key ministries in the country's new ruling coalition. The move - and the relatively muted reaction it prompted across the EU - begs the question of not only how much the far-right Freedom Party (FPO) has changed as it claims, but also how much Europe has changed. When the FPO last entered government as a coalition partner in 2000, the news was met with outrage and sanctions from the EU. More than 150,000 Austrians then took to the streets of Vienna to protest the inclusion in government of a party that summoned unwelcome ghosts of the country's past. Last week, some 5,000 people took part in anti-FPO demonstrations in the Austrian capital and EU officials chose their words carefully when addressing the new government headed by Sebastian Kurz of the Austrian People's Party. Comparing the response to the FPO in 2000 and now is a measure of how much Europe's political currents have lurched right-wards, with messaging once associated with the far-right - particularly on immigration - now increasingly mainstreamed. There is much trepidation over what the new coalition might mean, not just for Austria but Europe more generally, not least given the fact Vienna holds the EU presidency in the latter half of next year. "Things are doubtless different from the previous time, in 2000," tweeted Pierre Moscovici, France's former finance minister and Socialist party stalwart. "But the presence of the far-right in government is never without consequences." The UN's High Commissioner for Human Rights, Zeid Ra'ad al-Hussein, was a rare voice of stark warning. "I am very worried," he said, adding that the FPO entering government marked a "dangerous development … in the political life of Europe". Kurz's party won 32pc of the vote in elections held in October, garnering 62 seats in the 183-seat national council. The FPO party came third with 26pc of the vote and 51 seats. Under the coalition deal struck by Kurz, at 31 the youngest head of government in the world, the FPO will control sensitive portfolios in the new government, including the interior and defence ministries. The new interior minister, Herbert Kickl, previously a speechwriter for the FPO's former leader Jorg Haider, was responsible for concocting controversial party slogans including "More courage for Viennese blood", and anti-Islam campaign messaging. While Kurz's office will oversee European affairs, the post of foreign minister has gone to an FPO nominee. Kurz's deputy will be the FPO's head Heinz-Christian Strache. Having been involved with a neo-Nazi group in his youth, Strache now distances himself from such currents, and has suspended party members for making the Nazi salute in public. 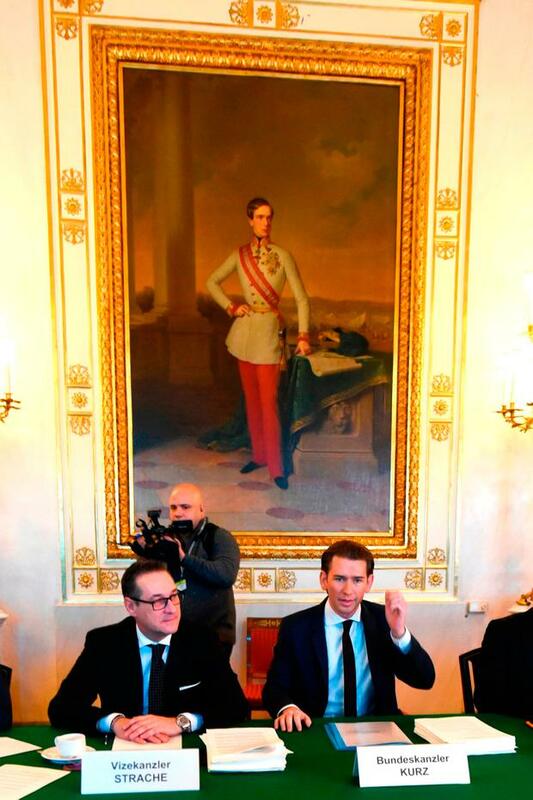 So what can Austria - and Europe - expect from the new far-right-tinged government in Vienna? The FPO has historically tilted Eurosceptic but Strache now says he has agreed to Kurz's demands to drop the idea of a referendum on EU membership. Instead, the new coalition says it "commits to Europe" while at the same time pledging to act to "steer the EU back in the right direction towards its fundamental ideas". During its EU presidency, it says, Austria will "take a leading role in correcting some of the erroneous developments" of the bloc. The FPO, which has a co-operation agreement with Vladimir Putin's ruling party in Russia, wants EU sanctions on Moscow eased and is staunchly against Turkey joining the EU. But it is the question of immigration, so central to the sloganeering used by both coalition partners in recent elections, that is likely to define the lifespan of Austria's new government. Tapping into anti-immigration sentiment that has grown in Austria over the past two years, the coalition pact agreed by the parties vows to introduce strict new rules on immigration and speed up deportation of those denied asylum. Those "refusing to integrate must expect sanctions" and "parallel societies" must be prevented, it says. Among the new measures the coalition plans to introduce is making asylum seekers give up any money they have when they submit an asylum claim, so that it finances their upkeep. During its EU presidency, Austria plans to hold a summit on immigration, raising concerns that it may seek to push a tougher anti-immigration line on the wider European stage. There are worries too that Vienna's shift to the right may also further fuel the populist currents already holding sway in its post-communist neighbours in central Europe, such as Poland and Hungary. Last weekend, Kurz described his coalition as one which wants to "actively shape Europe". The EU is about to find out what that might mean.